In a little over 24 hours Makenzie and I will be starting the molding process for her new wheel chair seat. I am nervous. Not nail biting, teeth grinding, nervous but none the less. I have never been through this process but from what I understand it goes a little like this......... They will start by making a mold of Makenzie's body. To do this Makenzie must sit fairly still to get a good fit. 3 years ago I envisioned the day when Makenzie would move. I day dreamed about her making the most simple of movements such as turning her head, and bending her legs. Today, I am nervous that Makenzie is not going to sit still long enough for them to get a good mold! Crazy!! After they get the mold done the seating specialists will make the seat and we will go back next week to make any changes, and fit it to the wheelchair base, headrest, footplate and several other finishing touches. This process could take up to 12 hours total and three trips across town. I am nervous! Did I say that already? I have been so excited about this. I am excited about the doors that it may open for Makenzie. This new wheel chair will not cure Makenzie but it could make life so much better for her. It should give her the support that she needs to do many things like use her talker more efficiently, drive a power chair, and use her arms more. I am excited because Makenzie has yet to have a wheel chair that REALLY works for her. The first chair we ordered for her was done with her seating specialist and her PT. We ordered it out of a catalogue about 6 months after Makenzie's accident and my main concern was that it not look like a wheel chair but more like a stroller. To be completely fair... Makenzie's body has changed a TON since we ordered the last chair but boy have I learned a lot since that day!!!! This chair has been hemmed and hawed over. We have spent hours in the clinic trying everything under the sun. This has been a VERY well thought out decision by Makenzie's whole team! 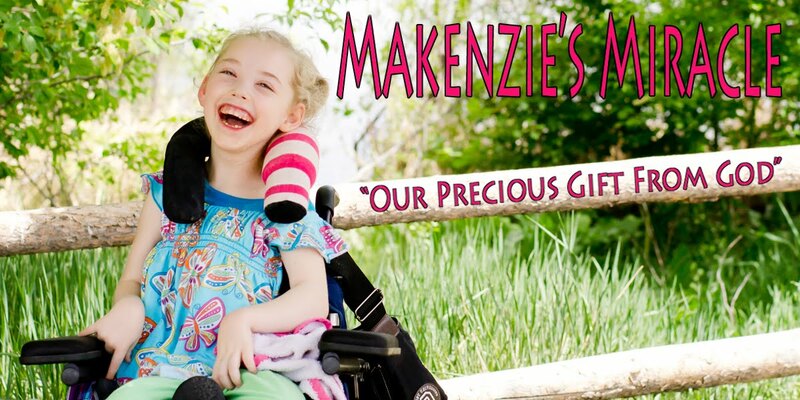 We started the processes to find the right wheelchair for Makenzie in May. We submitted insurance paperwork in July and now in December after only one denial we are here! 2 short weeks away! Tonight I am asking you to pray that Makenzie cooperates on Wednesday morning. Pray that she won't be scared and can relax so we can get a perfect fit! We are not going on a big therapy trip or vacation. Makenzie is not having a big medical procedure but for her and I this is a huge deal! Please say an extra prayer for her tonight! Pray also that when this chair is done it does what we all hope it will! Pray that Makenzie will never have to sit like this in her chair again! I am praying for Makenzie. She is such a strong little girl and I am sure she will quickly adjust to her new chair. What are some of the ipad games you use with her? I just got an Ipad and am interested in using it with my 2 little ones. Maybe you can distract her in the new chair with a toy or new game?